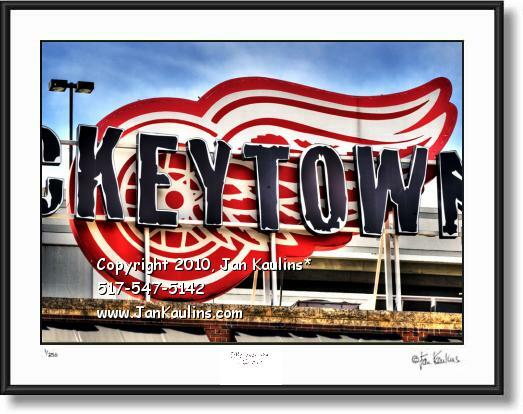 HOCKEYTOWN DETROIT RED WINGS photo picture print photograph art poster for sale. This is a wonderful colorful professionally created multiple exposure HOCKEYTOWN DETROIT RED WINGS art photo print for sale of this giant sized Detroit Red Wings logo which sits perched above The Hockeytown Cafe on Woodward Avenue in downtown Detroit. The vibrant colors and artistic appearance of this image are a result of nationally known photographer and artist Jan Kaulins having taken nine separate bracketed digital photographic exposures and blended them artistically to creat this unique photo.